It is no secret that I love the combination of chocolate and cherries. I already posted two recipes with this flavor combination here on my blog (Cocoa Cherry Granola and Coconut Cherry Cocoa Balls). I am still owing you the recipe of my favorite childhood cake which also features these main ingredients. Today I am sharing my first successful chocolate muffin recipe. I don't really have an explanation why, until now, my chocolate muffins were always a disaster. I consider myself not a novice when it comes to muffin baking skills (just look at my muffin list). However, chocolate muffins did never come right. The good news is the spell is over. I am not able to pinpoint what I did differently this time. In fact, I don't care, and so does my family as long as they have yummy muffins on their plates. 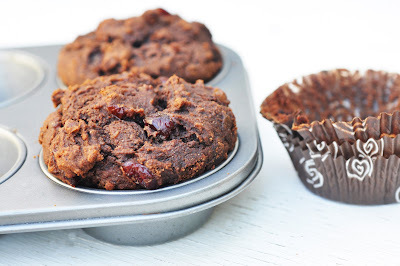 These muffins had a deep chocolate flavor, were moist and sweet at the same time, and the dried cherries, adding some refreshing tartness, were literally the cherry on the cake. My children never used to like my muffins. Just recently they started having them for breakfast. Therefore, I tried to include more natural sweetness, while at the same time cut down on concentrated sweeteners. I used to use agave syrup a lot. After some research I am refraining from it more and more, as it is by far not as healthy as I used to think. Please check here, if you want to read an interesting article about agave nectar. I am specifically proud of the date yogurt sweetening method that, firstly, provides natural sweetness to the muffins, and, secondly, keeps them moist and fluffy. I already bought a new package of dried cherries to make a new batch. In a food processor, blend chopped dates and yogurt to a creamy paste. In another bowl, combine egg, honey and oil. Stir into the date yogurt paste. Add wet to dry ingredients and stir until just combined. Fold in dried cherries. Fill batter into the muffin molds. Bake for 20-25 minutes or until toothpick comes out clean.